Salt, palm fat, flavourings, potato starch, maltodextrin, yeast extract, sunflower oil, sugar, beef extract (1.7%), caramel syrup, CELERY seeds. 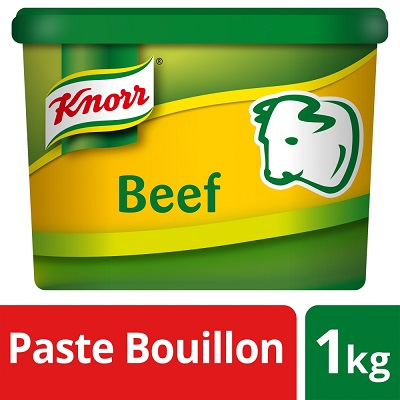 KNORR Paste Bouillon creates perfect bases and has been voted best stock by the Chefs Choice award for four years running. It is a roast beef flavoured bouillon that is lactose free and gluten free. Use our bouillon to refine and season your dishes. The 1kg variant can make up to 40 litres of stock. Our bouillon also comes in other flavours such as vegetable, chicken, cheese, fish, lamb or mushroom.